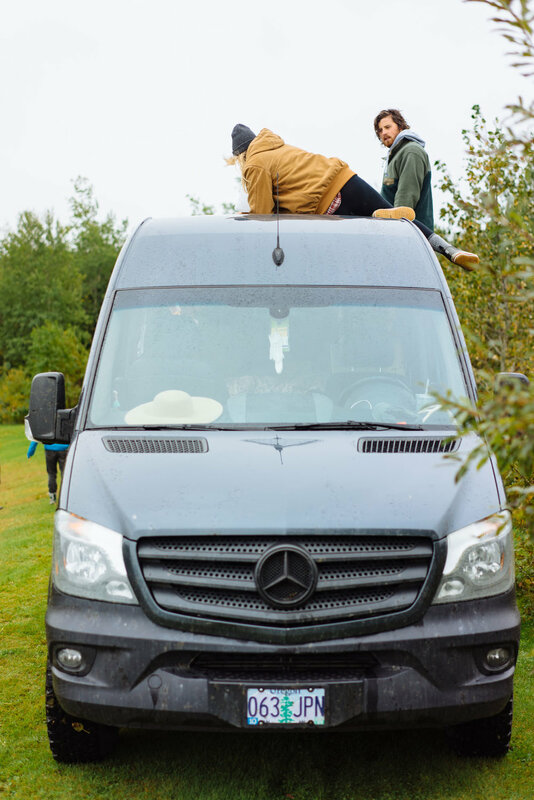 The first day of September was an exciting one for us, because we were heading to Gros Morne National Park! A park that we’ve long dreamed of seeing with our own two eyes. 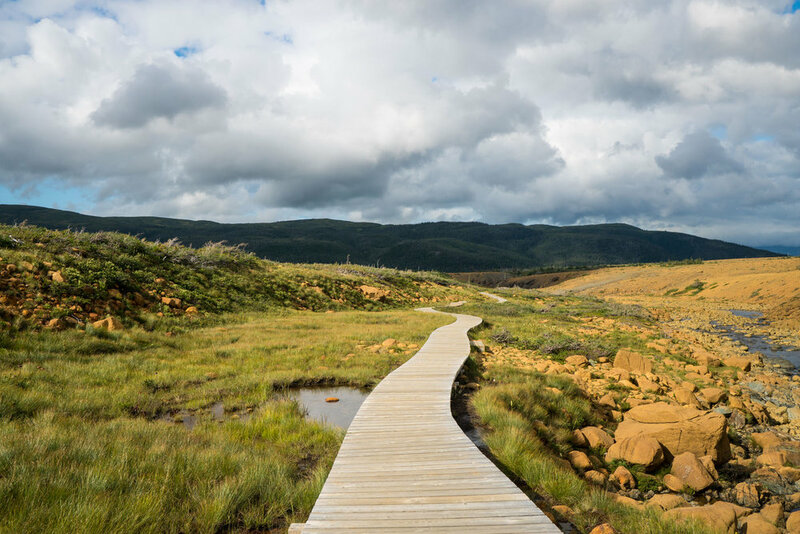 After arriving in Gros Morne we immediately went to the trailhead of a hike that we had found while doing research about the park. Our plan was to enjoy southern portion of the park before making our way up north. We were bummed to find that a large portion of the Green Gardens hike was closed due to cliff side erosion before we even started. However the accessible portions of the hike still promised amazing coastal views so we continued on the abbreviated hike. 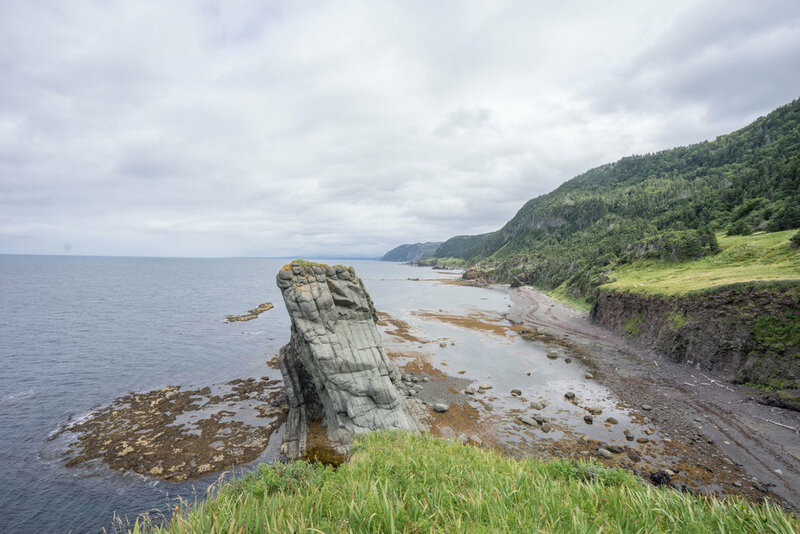 The hike started in the barrens of the Tablelands and crossed over the ridge and down to the lush coastline. The bright greens of the vegetation was beautiful against the clear blue of the water. 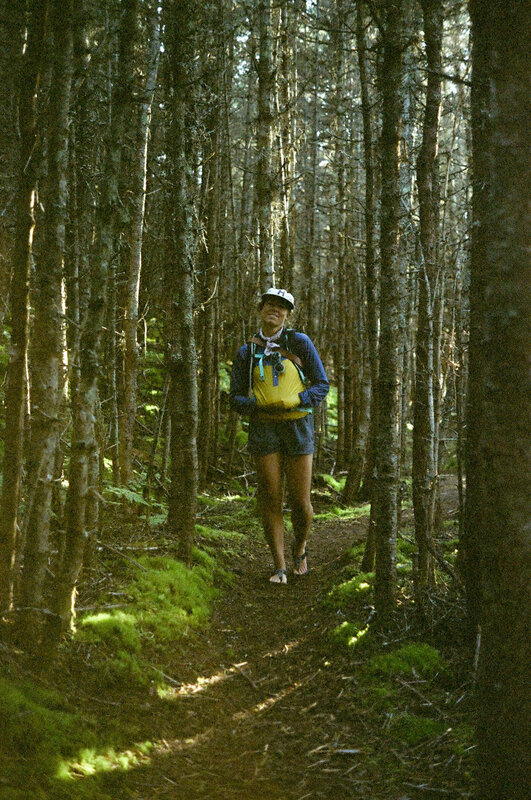 Down along the coast line are a series of camp sites that require backcountry camping permits. We had no idea they were there until we used one for our lunch spot. 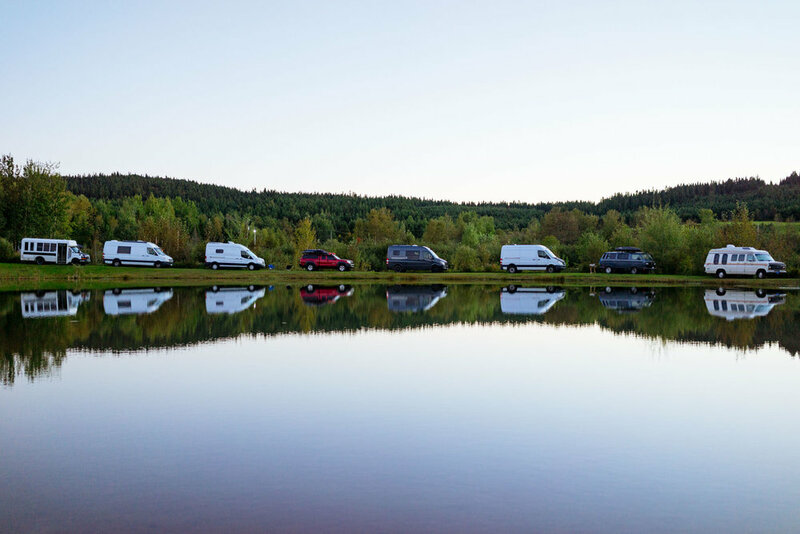 How amazing would it be to have these views from camp? 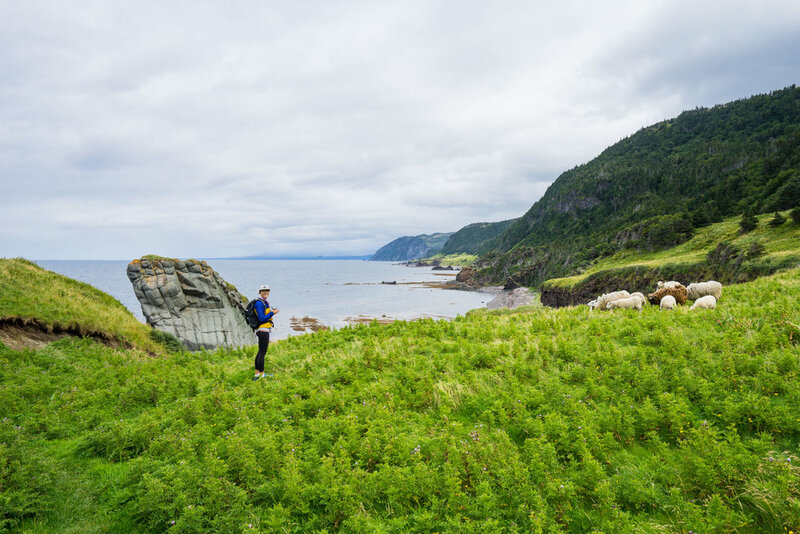 We want to go back to Gros Morne for many reasons, but staying a night in the Green Gardens is pretty high up on the list! Overall this was an incredible hike and a great way to start our time in Gros Morne. We hear the closed off portion of the hike was complete with sea stacks, waterfalls, and sea caves. All of which would have been nice to see, but this hike was breathtaking none the less! Where the Green Gardens Trail ends due to cliff-line erosion. After finishing our hike through the Green Gardens we headed back inland to explore the Tablelands. When we initially drove through the Tablelands we were completely blown away by how prehistoric this valley looked. We went on to learn that it looked this way for good reason. Apparently the Tablelands are actually exposed sections of the Earth’s mantle that were forced to the surface during a plate collision several hundred million years ago! Crazy right?! The type of rock that makes up the Earth’s mantle mostly consists of iron and lacks in the nutrients to sustain most plant life! Hands down the best part of traveling is learning things like this! So GD interesting! Hungry to learn more about the Tablelands we stopped to knock out the small and easy 4km hike that weaves through the barrens and into a surprisingly lush canyon. As we got closer we learned that the vegetation is able to grow in this area because of a stream that comes out of the Tablelands. During the hike I struck up a conversation with a young boy who was picking berries along the trail as he hiked with his family. He claimed to know what the mysterious berries were and said that they were good to eat. He offered me one, and me being the person that I am, I didn’t think twice and accepted his offer. The second that berry touched my tongue its texture was in my entire mouth. It was so nasty and strange. I don’t think I’ve ever experienced anything like it. I put on a brave face and told him it was good and we hiked on. I complained that my mouth tasted nasty for the rest of the day and I got no sympathy from Owen. That’s the last time I’ll eat a foreign berry given to me by a 6 year old of which I don’t know. Later that afternoon we went in search of camp. We spotted something on the map in the small town of Trout River in the southern most section of the park and went to check it out. It turned out to be a cemetery and in an effort to not disrespect the locals we decided to move on, but before we did we took some time to explore the adorable town. There’s a small boardwalk on the water behind the houses. While walking the shoreline we saw a horse come out of a house, met a man who offered us dinner, and learned about a massive whale that washed ashore here years ago that provided scientists a unique opportunity to study a complete blue whale. The town is proud of that whale to this day. The next day we continued on with our parade of hikes in the southern region of Grose Morne NP. We started at the Woody Point Discovery Center which is actually part of the Grose Morne UNESCO Heritage site. 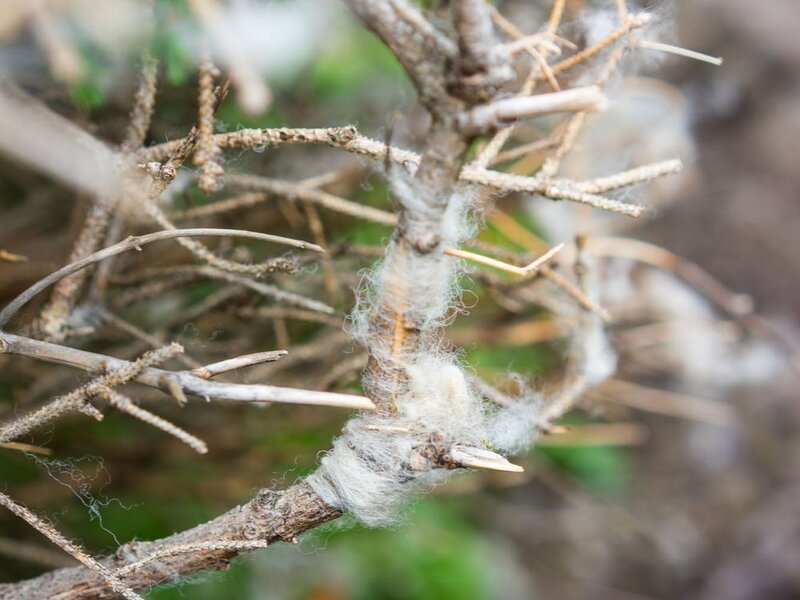 The Discovery Center was worth stopping for because it has all sorts of cool information about the Tablelands and the rich geological history of the area. Leaving from the Discovery Center’s parking lot is the Lookout trail, which is a 5km loop that went up to some impressive 360 degree views of the park. Looking to the south you can see the Tablelands and to the north we could see Gros Morne Mountain and Bonne Bay. The trail was under construction which made for an entertaining hike up through dense forest on fresh paths. The steep climbs were worth the views! The next day we made our way to the northern section of the park. In order to get there you have to cross through the mountains which we happened to do in the late afternoon which made for a spectacular drive. Once there we looked at the weather to determine which day we were going to summit Gros Morne Mountain. It’s important that the hike be done on a clear day because it can be really dangerous to get caught atop Gros Morne when a storm rolls in. The summit is exposed and would leave you nowhere to hide. With the weather working positively in our favor we made plans to hike the next day. Owen and I woke early to make a push to the summit of Gros Morne, but as we got ready to leave the sky looked dark and threatened rain. We checked the weather and decided to call off the hike and try the next day. Since we were already up we headed to the coast and found a parking spot near the water where we spent the morning luxuriously reading, drinking coffee, enjoying breakfast, and doing yoga. Around 10am it still hadn’t rained, and even started to look like it was going to shape up to be a beautiful day. To fill our time we decided to head to Greene Point for the Ranger Walk. If you go to Greene Point, do yourself a favor and do the guided Ranger walk. It was absolutely fascinating! As it turns out the headlands of Green Point are home to the most complete geological feature that captures the last 500 million years! Scientists come from all over the world to study the rock here because of how rare 500 million years of exposed rock is. The ranger who did the walk was super entertaining, funny, and really fun to spend the afternoon with. 10/10 would recommend the ranger walk at Greene Point! During the Ranger walk we kept looking back at Gros Morne Mountain and kicked ourselves for not going ahead with our plan because the day just kept getting clearer. 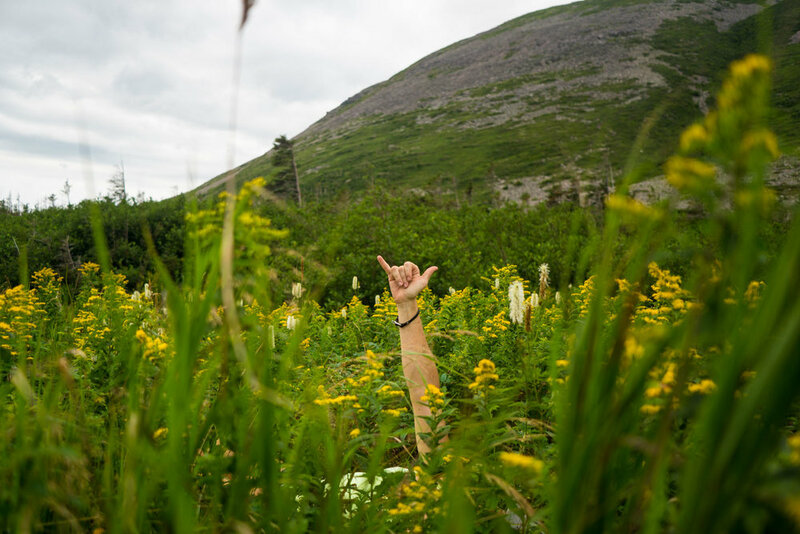 After the ranger walk and a bunch of sad glances at the mountain, we decided… what the hell lets hike Gros Morne! I know this might not seem like a big deal to be starting a hike like this at lunch time, but the hike is over 16km and has an 800km elevation gain and loss. For hikes of this stature we like to get an early start so we can beat the crowds and not feel the pressure of nightfall. Even though this is the most challenging hike in the park, it’s also the most popular. There was no chance we were going to be beating any crowds, but we figured it was better to do the hike, than not at all. When we arrived in the parking lot there were very few spaces left. The place was packed, but there wasn’t a soul to be found. Feeling a sense of urgency we quickly packed our bags and got on the trail. The first part of the trail was a gradual climb through dense forest and wild flowers and we soon neared the real challenge of this hike. The choss pile. Up until this point the hike was pretty casual and elevation was gained slowly over time, but this is where things took a turn towards the sky. See all those rocks? Not a single one of them was solidly in place. 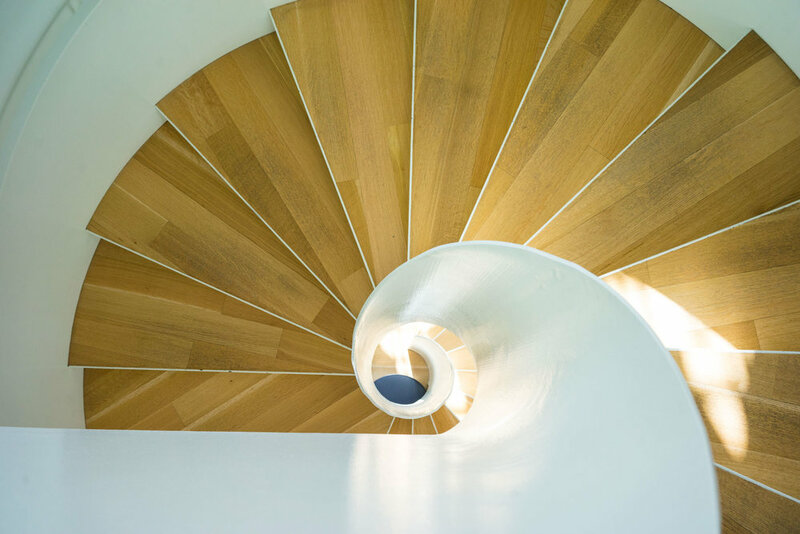 With every step we had to choose wisely to be sure that it wouldn’t shift out from underneath us. We were lucky to have some borrowed hiking poles with us. 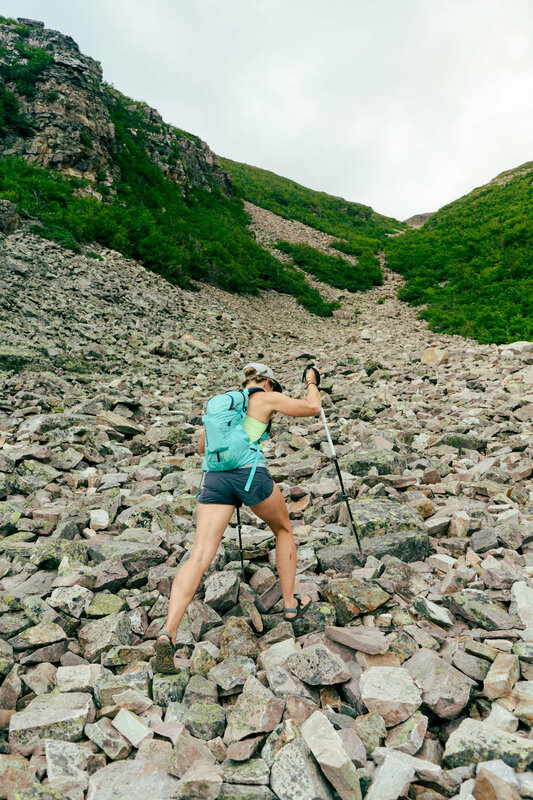 We’ve never been believers in hiking poles, but this hike turned us into believers! If we didn’t have the hiking poles it would have been a lot harder to identify solid ground as we navigated this 500m climb. Once we made it to the top, the hard part was over and we were able to cruise the last little bit to the summit. We were so happy we decided to hike that day because shortly before coming over the side of the mountain the skys fully cleared giving us expansive views to the south. 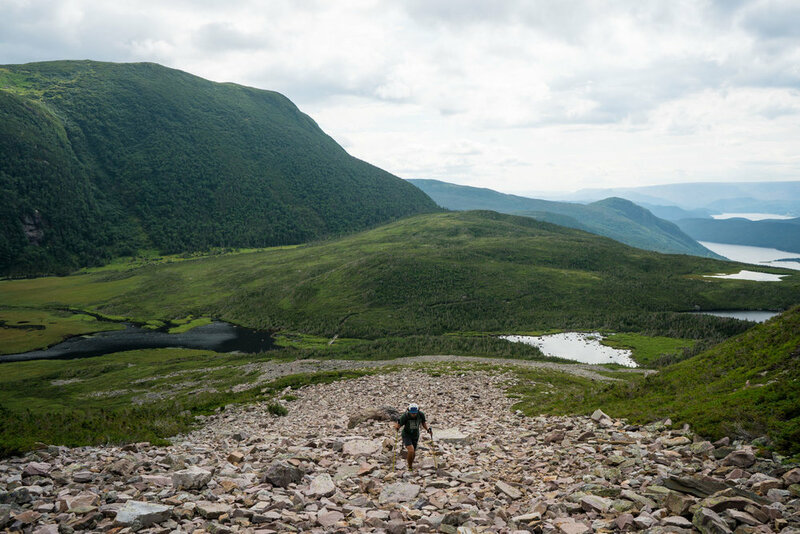 The terrain atop Gros Morne is classified as Arctic Alpine with low growing grass and shrubs. 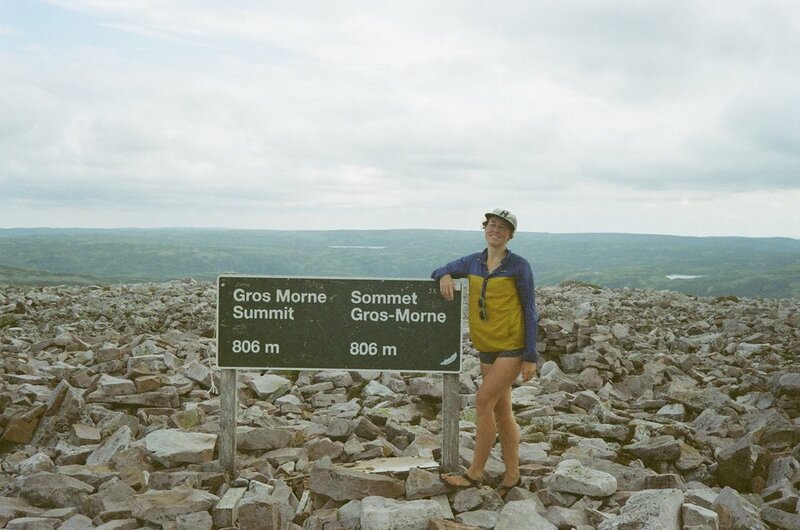 We made it, all 806m from sea level to the top of Gros Morne! After the summit the hike continues in a loop over to the north of the mountain giving views to 10 mile pond. To this day we are not entirely sure how the hell a body of water that big can be classified as a pond, but hey, no one asked me! Then we continued to the western facing side of the mountain where we started our descent down the back while looking over the Long Range Mountains. It felt like we yelled “Are you kidding me?! This is amazing!” around every turn. On our way down we even spotted an elusive and well camouflaged Rock Ptarmigan after it squeaked at us! The rest of the hike was easy for the most part, but our knees did start to feel the 800m of elevation loss on the return trip. We were convinced we were going to be hiking in a crowd the whole time because of how many people were in the parking lot, but to our surprise the length of the trail spread people out enough that we saw less than 10 people on the whole journey. In all the hike to the summit of Gros Morne mountain and back was well worth the effort, and we’re glad that we went despite the late start! The next day we woke up and decided to take it easy after our hard day of hiking. 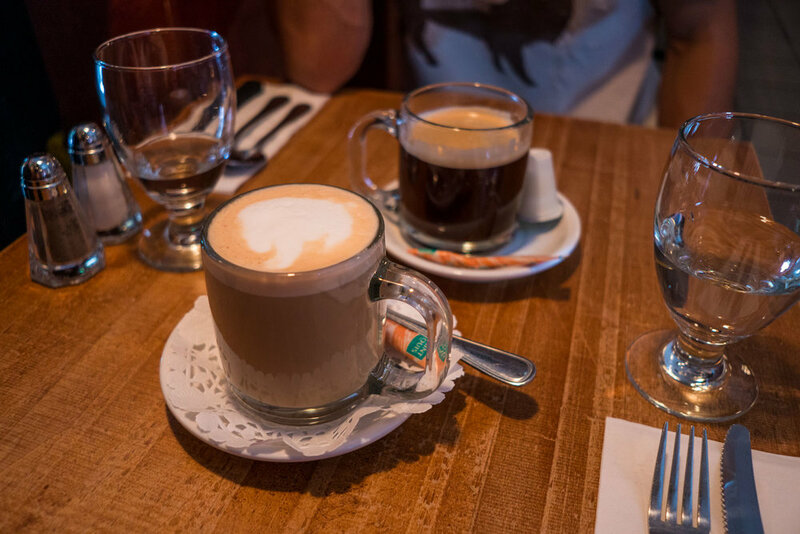 We went into town and found a coffee shop to take a load off and sort though a few weeks worth of photos. At lunchtime we headed to Cow’s Head to do a little hike along the coast. The hike to the headlands of Cow’s Head was an easy 4km that we hoped would give our legs a chance to recover from the day before. The hike was beautiful in the later afternoon in the golden light. We even found a few abandoned fishing shacks that people used to use during the summer fishing months. When we returned to Lando, we were met by a friendly local man who lived in a house nearby. We got to talking and turns out his wife is a very accomplished artist and they used to live in a short bus! We got a tour of the bus and her studio. Her work was mostly large scale scenery painting of Gros Morne and the surrounding area. She was very talented! We said our goodbyes and headed to camp. At first glance our camp spot that night was not glamorous. It was a small pull off tucked out of the wind near the road. As the sun sank in the sky I climbed to the top of the berm to be met with this view. The sunset was fast and intense. Look at that?! Newfoundland you will never cease to amaze me! As we came into this area we learned that “the thing to do” is the boat tour of the famous Western Brook Pond. We decided to bite the expensive bullet and do the tour because it’s the best way to see the enormous “pond”. If I recall the tickets were $60CAD a person, that’s a lot for people who don’t normally go the touristy route. Western Brook Pond, again, why is this a pond?! It’s deepest point is an impressive 165m (541 ft) and is surrounded by walls that are 600m (2000ft) high! The pond is technically an inland fjord even though it is now cut off from the ocean by a small strip of land. To take the tour you have to walk 3km one way to get to the marina where the boats launch from. Was it worth the money and the crowds to do the tour? We have mixed feelings about it. Yes, because it is a great way to see the entire length of the pond and all its features. No, because it was expensive, overloaded with tourists, and you had to jostle with everyone to get a clear view of anything or to take any pictures. It’s not really our scene to listen to tour guides over the intercom point out rock features because they look like a man’s face rather than for their geological significance. However, we did get a healthy dose of Newfoundland country music on our return trip! Wow, what a treat that was! 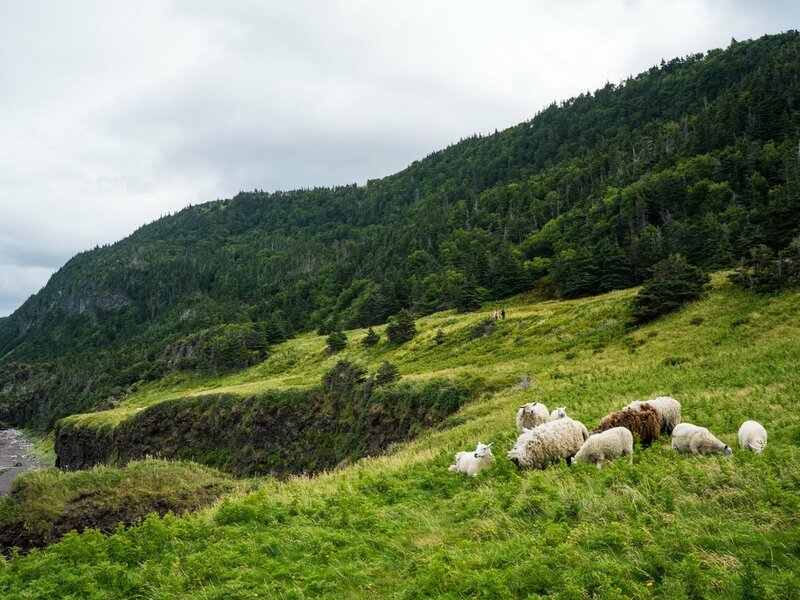 With our time in Gros Morne drawing to a close Owen and I headed north towards our final destination in Newfoundland, but we found a few delicious and beautiful pitstops along the way. We don’t have any pictures of the Sunrise Bakery, however this little hole in the wall was a highlight for us. After a few attempts at Newfoundland cuisine, Owen and I came to the sad conclusion that it’s really not our thing. 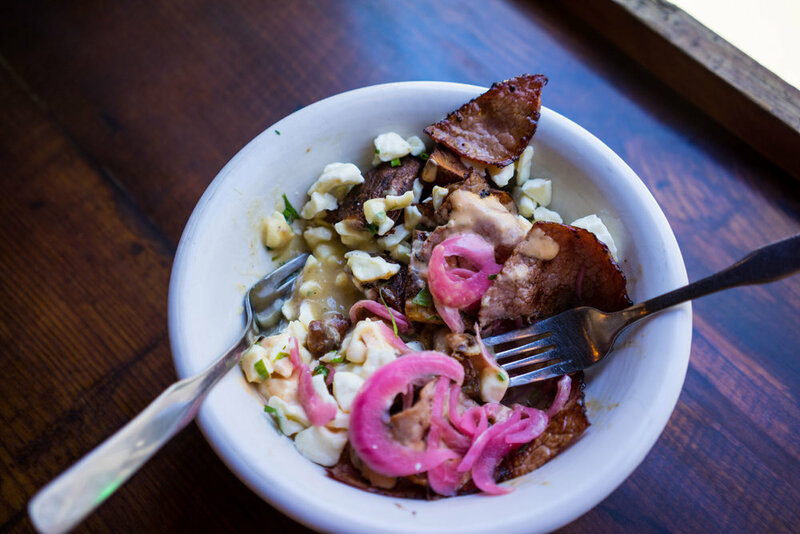 There are only so many things you can do with white fish, potatoes, and vinegar. This realization led Owen and I to making most of our own food for the last few weeks. As we headed north we were low on food and energy to get creative. We saw the Sunrise Bakery and pulled over. We got the sense that it was a local spot because two bacon cheese burgers, fries, and dessert for the both of us was a whopping $9CAD and was life changing. The local patrons that were hanging out were fun to talk with and even helped us pick out our desserts. With happy bellies we made our way just a few more kilometers up the road to Arches Provincial Park. 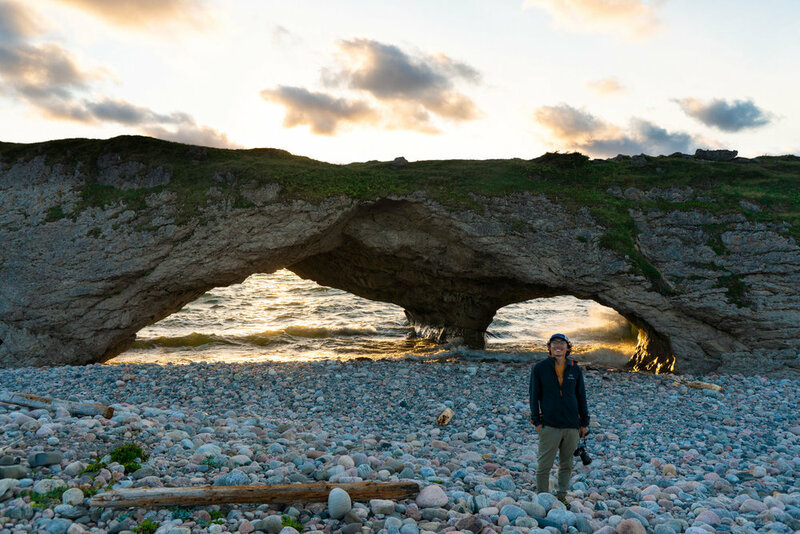 The park is laughably small on the map because it barely contains the land on either side of this large rock which is home to three perfectly formed sea arches. Despite the size of the park it was an impressive and beautiful site as the sun started to set! Continuing on towards our final and furthest north destination in Newfoundland we started to notice the weather changing. Turns out winter, that the locals claim to be fall, sets in really quickly in this part of the world. Parts of Gros Morne were actually shutting down for the season before we left. It seemed like everyone was talking about how things were going to start feeling different around Newfoundland. With the cold, driving wind at our backs we headed towards L'Anse aux Meadows. 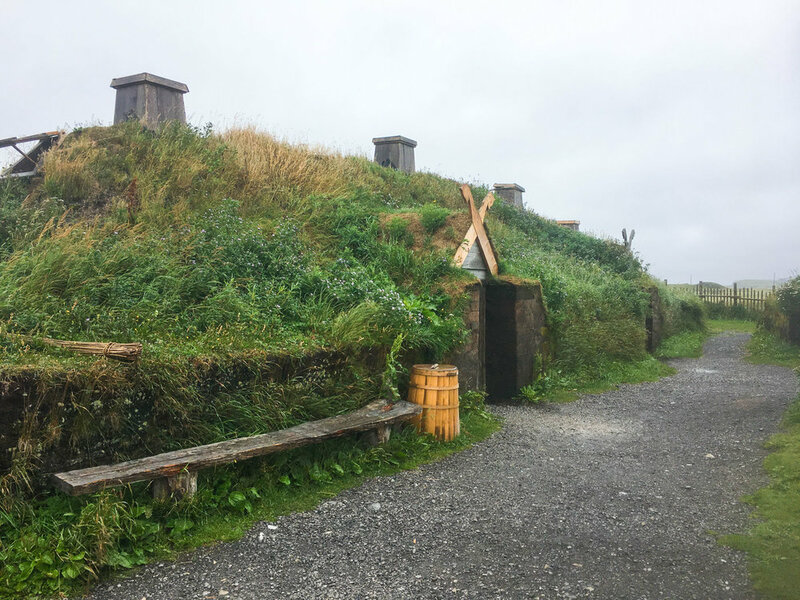 For those of you who aren’t familiar, L'Anse aux Meadows is another one of Newfoundland and Labrador’s impressive four UNESCO World Heritage sites! Even though it was a cold and rainy day in L'Anse we were excited to learn about the site’s impressive history. L'Anse aux Meadows is the site where Vikings, the first ever recorded Europeans to reach the new world, arrived over 1,000 years ago. Though the buildings are reconstructed examples of what historians believed the site looked like it was fascinating to learn about. 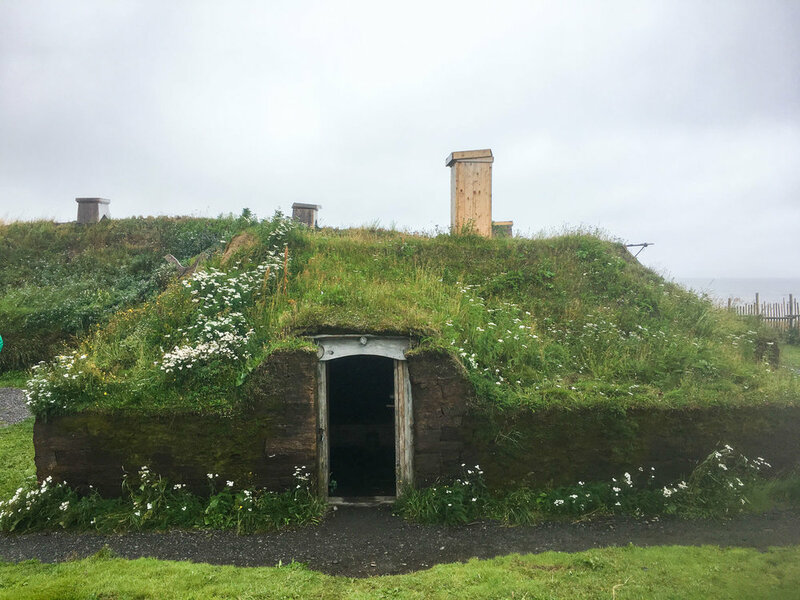 We did a walking tour by a local man who grew up in L'Anse aux Meadows and remembered when the hills he grew up playing in were discovered to be the important world heritage site that we know them as today. It was absolutely fascinating. After having a gloomy but nice day we headed south towards the town of St. Barbe where we would be leaving for Labrador the next day. We found our way to camp near the water where the above pictures were taken. It was a happy and sad evening. Sad because we were spending our last night in a place that we’d deeply fallen in love with in our short two weeks of being there. Happy because we were so appreciative of our time there. The day had come, it was time for us to head further north and into Labrador. 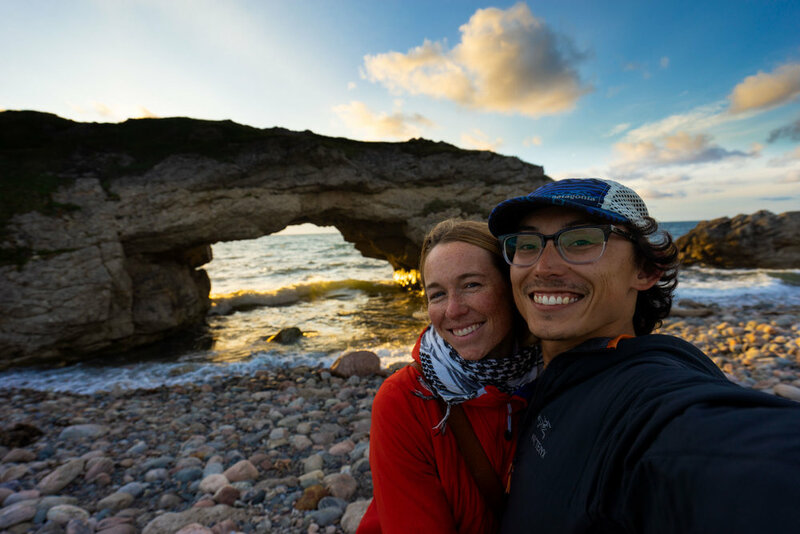 While in Newfoundland and Labrador Owen and I decided to take a two week vacation from work because we knew that it was a place that we wanted to dedicate our entire focus to. The day that we took the ferry into Labrador we had about three days left in our vacation. Our plan was to spend the next three days exploring and traversing Labrador before entering Quebec. The ferry to Labrador was a quick two hour ride to the town of Blanc Sablon, which is technically in Quebec. When we arrived on the other side we realized that we didn’t know a whole lot about the road ahead of us. Even though people refer to the road as the coastal highway it’s actually only on the coast for a short amount of time. In order to go west to Quebec you have to take the Trans Labrador Highway (TLH) 1,250km (774.66 mi), which first goes east along the coast before it then turns west towards the province of Quebec. There was a small 50km section of the highway that did leave from Blac Sablon and headed south along the coast of Quebec but it quickly becomes a dead end. Before we knew about the “highway system” that connects Labrador to Quebec, our plan was to head south along the coast, but that doesn’t really exist. There’s a bigger story in there about that small section of coastal highway that we hope to tell someday, but we’ll cross that bridge when we come to it. What I will say is that this isn’t going to be our last time to this part of the world. This trip has sparked an interest in this part of Canada. 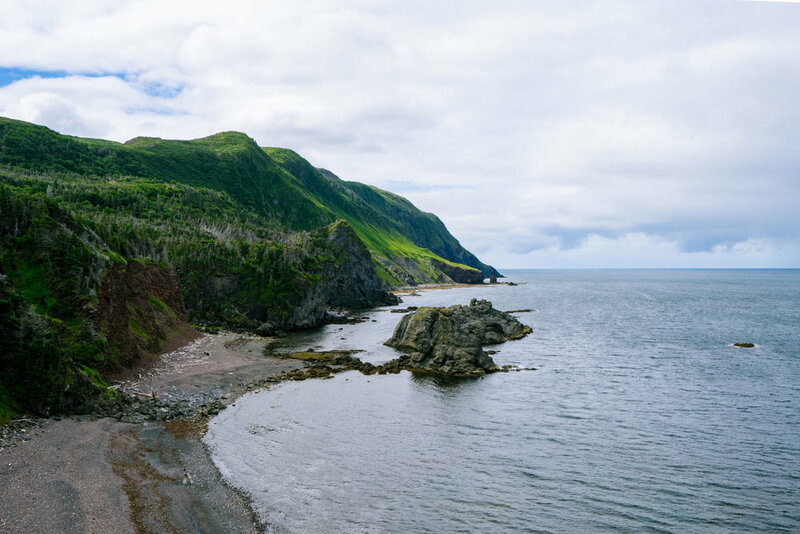 We want to spend so much more time exploring Newfoundland and the more remote sections of Labrador and coastal Quebec. But lets get back to the many kilometers of the TLH. After arriving in Labrador we quickly hit the road heading east on Route 500, we were unsure of what we would see and do along the way. Labrador is impressively undeveloped so everything that there is to do that is accessible by car is right off the highway. So when we saw the sign for L’Anse Amour Lighthouse we pulled down the small dirt road to see what there was to see. We toured the lighthouse, learned about the people who have maintained it, and enjoyed the view before getting back to the road. We don’t have any pictures from Red Bay, but it’s the third UNESCO world heritage site that we saw that month and had some killer fish and chips! There was an impressive museum documenting the Basque whaling communities that used to populate this area of Labrador. We have never traveled a road quite like the Trans Labrador Highway. Of the 1,250km a very large portion of it is unpaved. Everyone we met that heard of our plans to continue onto Labrador would jokingly say “hope you have a spare tire or two” or “be ready to buy a new windshield once you get to Quebec”. We would always laugh it off because we were armed with a new found confidence. We’re the proud owners of a trusty Toyota Tacoma! By our calculations we think about half of the Trans Labrador highway is unpaved and made up of loose gravel. We went hours without seeing pavement or any people other than road construction support vehicles. Construction crews work tirelessly through the mild months of the year to complete the highway, but it sounds like they are fighting an uphill battle. Every year as Labrador thaws the freshly paved sections of highway are damaged by the harsh conditions of winter and are in need of repair. Dump trucks would always fly by at an impressive speed spraying loose rocks and dust all over us. We learned early on that if we were going to arrive in Quebec with an intact windshield that we needed to have our wiper blades on when the trucks passed. Thanks Jorge and Jessica for the tip! As we pressed on we came to the realization that the time we had left and our gas range were not going to allow for us to venture very far off the beaten path. Each night along the TLH we made camp in construction equipment lots because there aren’t even small off shoot roads from the highway. As long and monotonous as the drive was, it was so impressive to see that much continuous undisturbed wilderness. With Labrador being so remote, we had to be very strategic about how much gas we used and when we filled up. On the longest stretch we barely made it with a full tank of gas. When we arrived in Churchill Falls we filled up our tank to the tune of over $7USD a gallon. We each shed a single tear as we began pumping, and no, it wasn’t the bone chilling arctic winds whipping out of the north causing our eyes to water. On September 7th during another full day of driving, we drove through out first snow just before arriving at Labrador City. That was our sign to keep moving! 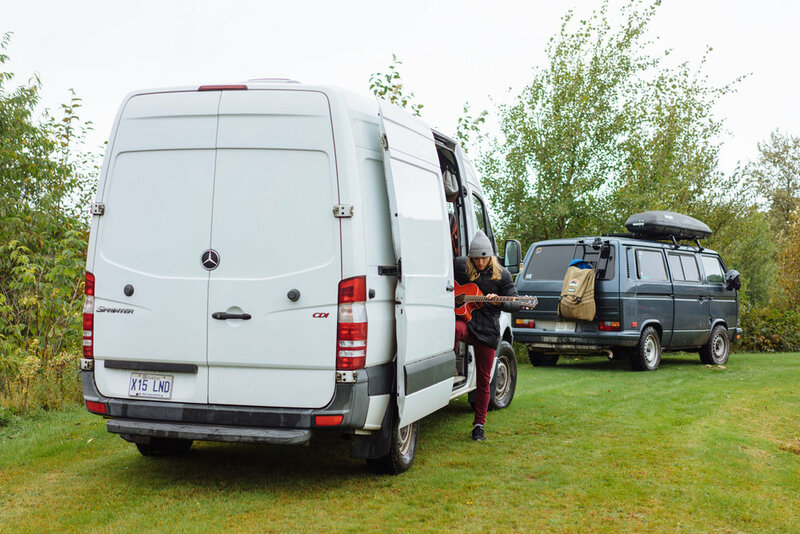 We thought that crossing into Quebec would bring a change for the better in the road quality, but we were met with more wilderness and more unpaved highways. Now the locals were speaking French though! The stretch from Labrador City down to Baie-Comeau slowly got better as we neared the coast. Service on the way to the Côte-Nord (North Coast) of Quebec was just as remote as anything we saw in Labrador. Sadly, this mean we had to press on, only stopping to eat, sleep and take some drone photos (although the drone came down almost immediately because of freezing temperatures and high winds). The photo above was taken at a place that has long fascinated me on the map! Turns out this feature was created a long time ago when a meteor hit the earth here! Cool right?! Since then the depression in the earth has filled in and become a lake! Even with a drone it was hard to get a real idea of the scale of this impressive feature! I was just happy to finally be able to say that I saw it! That is a crazy looking feature isn’t it?! The road to the town of Baie-Comeau continued with more of the same. 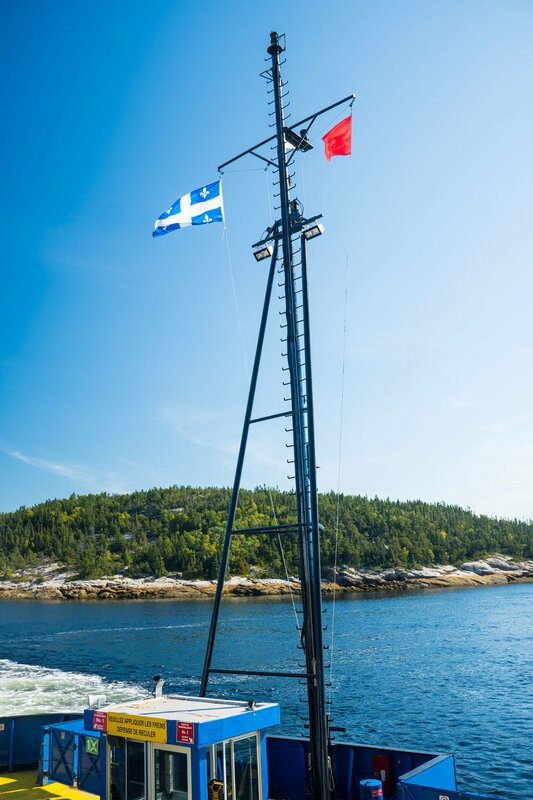 Once we hit the coast of the St. Lawrence river we continued south along the water. We had many lovely camp spots and even had our fifth ferry ride of the summer across the Saguenay river in Tadoussac. The coastal drive towards the city of Quebec was beautiful and peaceful. Alas, Quebec City! As mentioned in last month’s blog post, cities can be a bit overwhelming for us, but this time we came prepared. 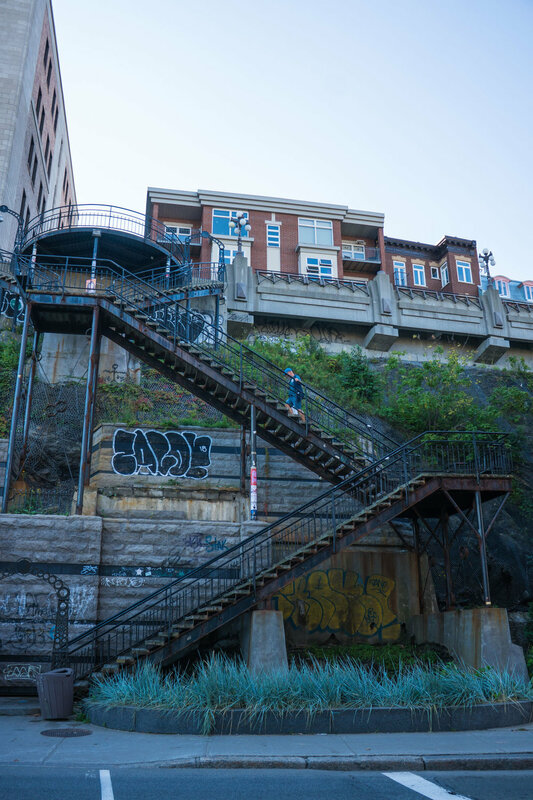 Owen and I were VERY excited for the city of Quebec because of it’s old world European charm, history, architecture, and impressive food scene so we came prepared. Before arriving in the city we scoped out a parking lot with an attendant that we would feel comfortable leaving Lando at all day. 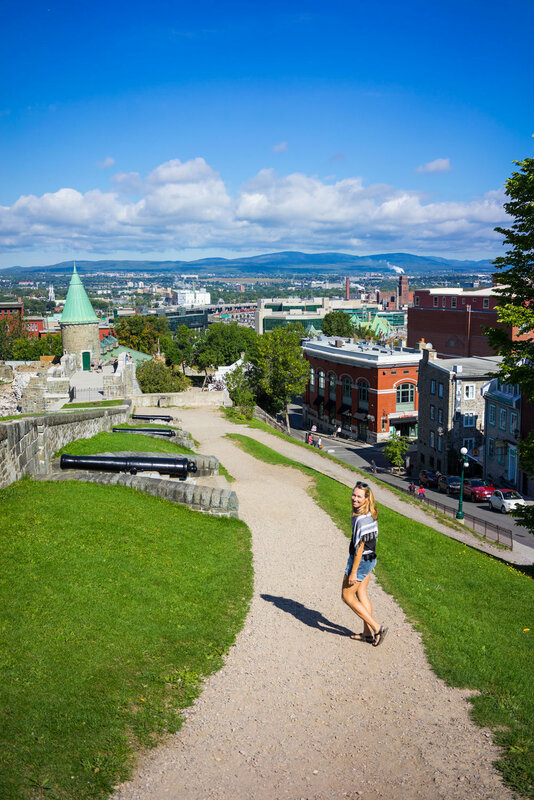 This way we could be care free as we frolicked around Quebec City. After leaving Lando we had a mile or so of walking to get to the old, fortified portion of Quebec where we planned to spend the next two days exploring. 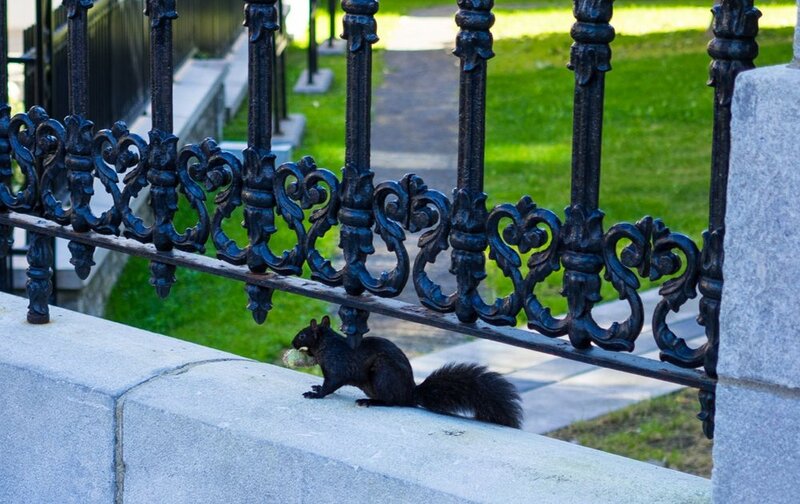 We strolled through the streets of Quebec, listened to the organist at the Notre-Dame de Québec Basilica Cathedral, and enjoyed the art at the Musée National des Beaux-Arts where we learned that we have an affinity for Inuit art. 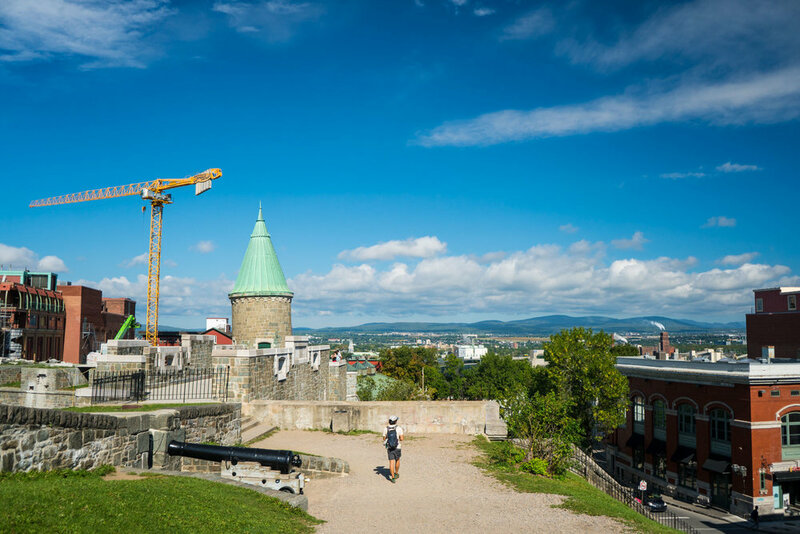 We found a library in a converted cathedral and explored the fortified walls that now snake through downtown Quebec and loved every second of it! When in Quebec “Treat-yo-self”! The food was particularly wonderful after coming off of a month solid of cooking from Lando’s tailgate. As you can see here, we didn’t hold back our desire to try as much local food as possible in Quebec. It was our mission to try the best crepes, poutine, croissants, and ice cream that the city had to offer. We were not disappointed! Croissants: Paillard - Where we had a classic Croissant, Almond Croissant, and a stuffed bread with brie, nuts, and dried berries! Ice Cream: Chocolats Favoris - World’s fanciest dip cones and damn, they were so good. Our view from camp across the water from downtown Quebec City. The moon was so orange that night! 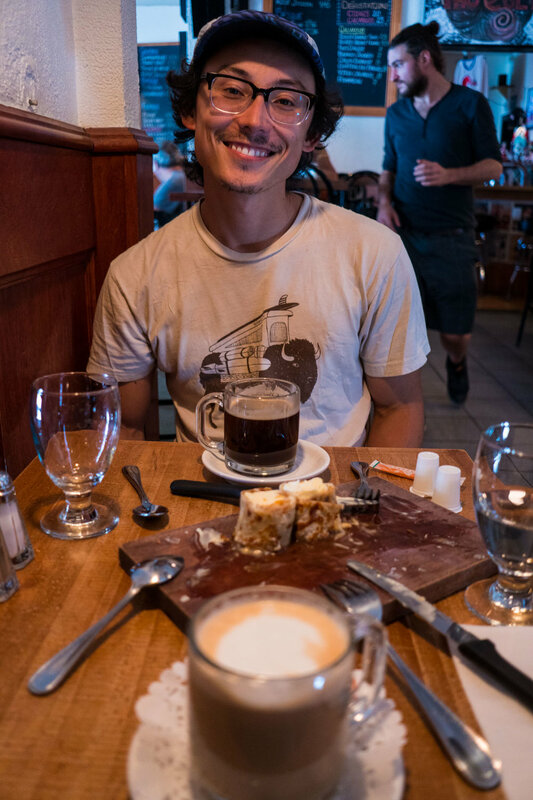 Our last night in Quebec we met up with Julien of Go-Van and the rest of the freelance team. Even though Owen and I both do work periodically for Go-Van, we had yet to meet anyone from Go-Van in person. We met up for dinner in a neighborhood in Quebec. We knew that we were getting close because the street by the restaurant was lined with a Vanagon, three sprinter vans, and a converted short bus. Everyone happened to be in town because in a week’s time we would all be heading south the a Go-Van event called El Campo. 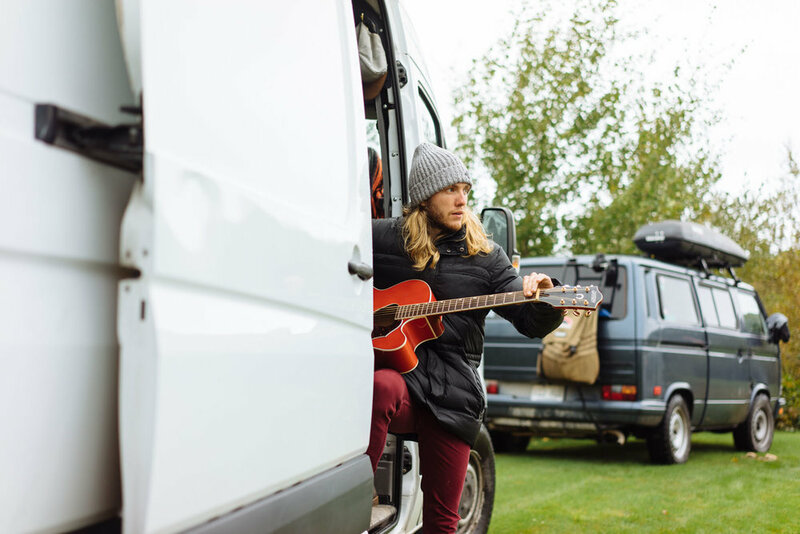 That night we met Julien - Owner and operator of Go-Van, Katie - Editor in chief of Go-Van.com, Paul - freelance videographer, Anthony - talented musician, and Sam - Carpenter/musician/nicest guy ever, all of which also live full-time on the road! We had an instant connection with this group. After we finished dinner none of us wanted to leave one another so we found our way to a spot across the river from the city. We parked on a quiet street that looked back at the skyline and the beautiful moon. That night we stayed up way past our bed time trading stories and drinking whiskey with people who felt like they had been friends all our lives. We stayed the night on that street all in a row. The next day Paul, Anthony, and Sam went their own ways to take care of the work week. The night before we hugged them goodbye and told them we’d save them a spot at El Campo. 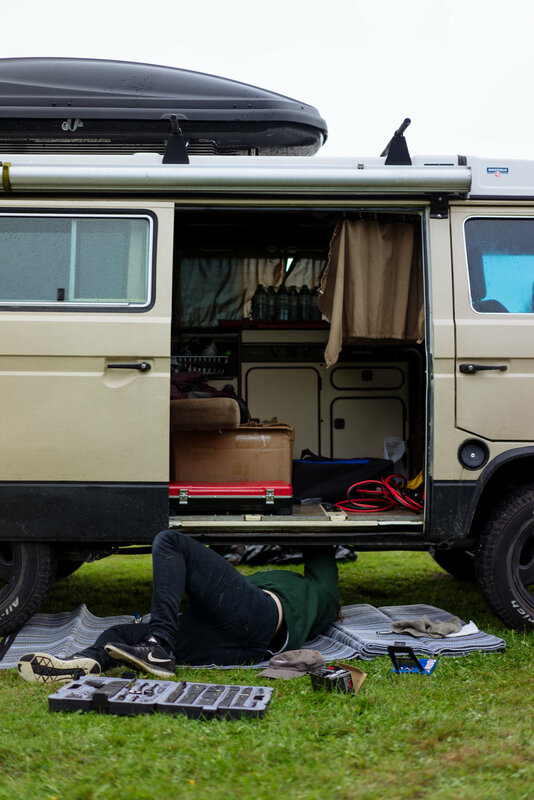 El Campo is a vanlife themed meet up that is put on by Go-Van. 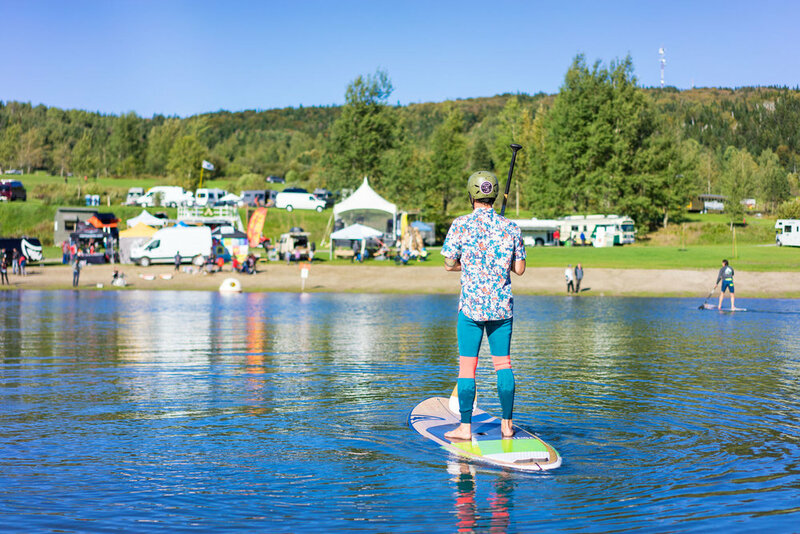 People come from all over Canada and beyond for a weekend of camping, fun activities, music, and guest speakers. There was a lot of prep work that needed to be done at the event site so Julien extended the invitation for us to come and work in a building on site with him and Katie for the week leading up to the event. 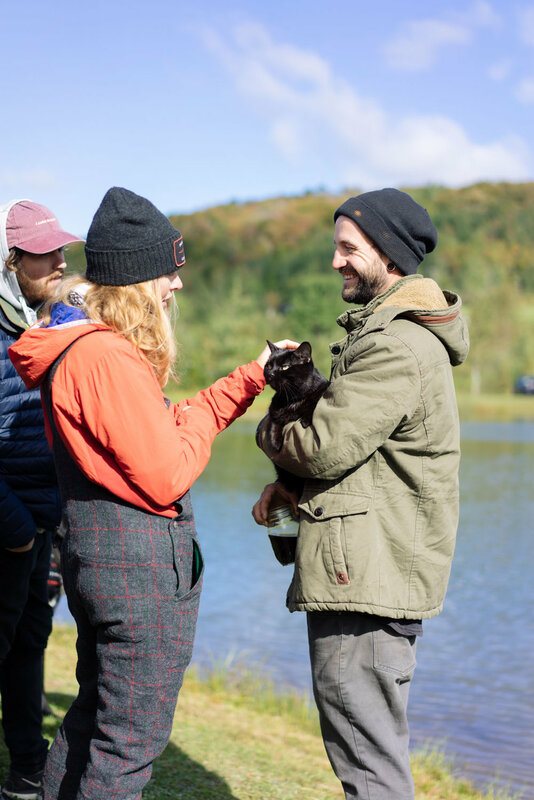 MAK, Katie, and Julien working for a week from Domaine du Radar. MAK is actually playing with a cat. More poutine. Can’t stop, won’t stop! Katie and Julien enjoying… poutine! We were thankful to have a warm dry place to spend the long work week. 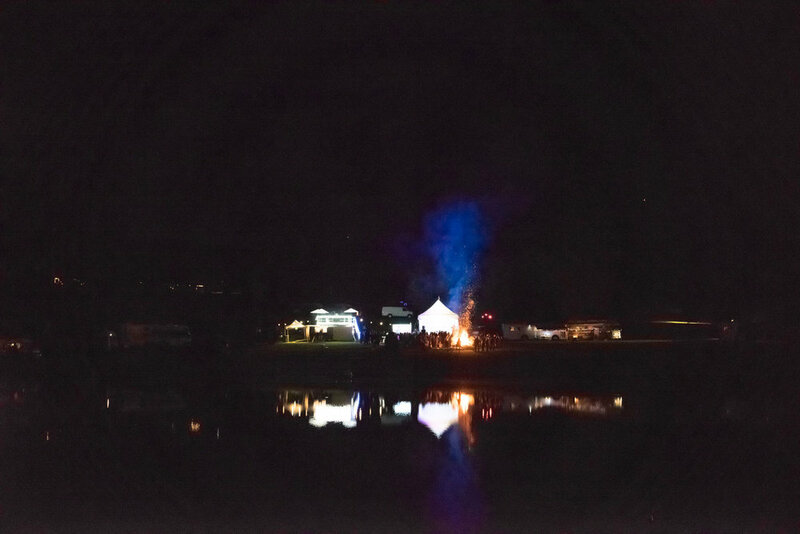 We spent our working hours huddled around our computers with a wood burning stove to keep us warm, and at night we would camp together and enjoy our evening around a fire with beers in hand. Julien and Katie asked if Owen and I would talk about our recent experiences building out Amelia. Owen isn’t a fan of being on stage so I accepted on our behalf and planned to tell our story for the both of us. That week I started to look through the build photos of Amelia for the first time since her completion nearly three months before. It was the first time that I really processed my feelings about the whole experience. Our many campsites around Domaine du Radar the week leading up to El Campo. Finally the work week came to a close and all of our new friends showed back up for the weekends events! Imagine that, a broken down Vanagon! The weekend was so much fun! It was nice to take some time to sit still and enjoy the company of all of our new friends. We’re so lucky to have the opportunity to spend time with so many like minded people, the connections are fast and easy. It never ceases to amaze me how at home you can feel when you are surrounded by great people so far from home. Slack lining was one of many activities available over the weekend. While we were at El Campo we had the privilege of giving our neighbors, Exploring Alternatives, the only of Lando to date. Danielle & Mat have an incredible YouTube channel to fill your need for alternative living options! 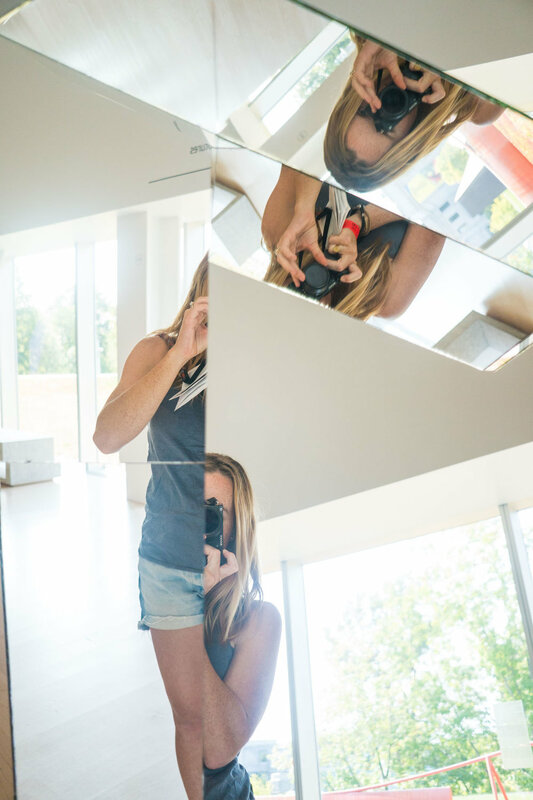 They interview hundreds of people each living in a different way that best suits their life style. Give them a look! Saturday night was my night to give my “speech” to the 400+ people at the event. I was nervous but excited to share our story. I named my talk “Three years and three vehicles”. After it was over it felt like the weight of our experience with Amelia had finally been lifted off my heart. That night helped me realize that everything had to happen the way it did so that we could have the best summer of our lives. We had to be delayed countless times so we would decided to see the east coast of Canada rather than our original plans to head west. I realized that I wouldn’t go back and do a single thing differently. The next day we had a relaxing morning listening to Anthony preform before starting the teardown process. Everyone who helped went out to breakfast at a small local restaurant that somehow had enough food for all of us. It was delicious, the company was great, and we were introduced to Canada’s gift to the world: maple butter! It’s a life changing spread made simply from maple syrup that has been heated and whipped. After breakfast it was sad to see everyone drive off and go their own ways. It felt like we had gained a new family that weekend. We however, didn’t leave right away, Owen and I stayed back with many of the people who were camped around us that weekend. Being that most of us live on the road full time, none of us really had anywhere to race off to. The rest of the month we spent moving slowly through Quebec, working and hanging out with Katie, Paul and Julien. For so long leading up to this we had been on our own, it was nice to move around with some company for a change. Well that’s it my friends! Next up I’ll recap October & our last weeks Canada!